^ 1.0 1.1 "Death of Mr. Rhodes", The Times, 27 March, 1902. ^ Martin Meredith. Diamonds Gold and War. New York: Public Affairs. 2007. ISBN 1586484737. 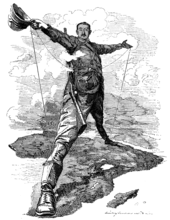 ^ Richard A. McFarlane, "Historiography of Selected Works on Cecil John Rhodes (1853–1902)", History in Africa, Vol. 34, 2007, pp. 437 - 446. ^ Basil Williams. 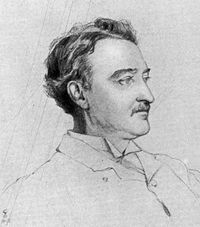 Cecil Rhodes, Makers of the 19th century. London: H. Holt & Company. 1921. ASIN B0024DGB8Q. ^ 6.0 6.1 6.2 6.3 6.4 6.5 Thomas, Anthony. Rhodes: The Race for Africa. London Bridge. November 1997. ISBN 978-0312169824. ^ 7.0 7.1 7.2 7.3 7.4 7.5 Flint, John. Cecil Rhodes. Little Brown and Company. November 1974. ISBN 0-316-28630-3. ^ Edward Jay Epstein. The Rise and Fall of Diamonds. Simon and Schuster. 1982 [27 November 2008]. ISBN 0-671-41289-2. ^ The Economic Development of the British Overseas Empire. Taylor & Francis. 2005. ISBN 0-415-35048-4. ^ 10.0 10.1 Boschendal. Boschendal Limited. 2007. ISBN 978-0-620-38001-0. ^ Gerhard De Beer, Annemarie Paterson, Hennie Olivier. 160 Years of Export: The History of the Perishable Products Export Control Board. Perishable Products Export Control Board. 2003. ISBN 9780620309677. ^ Information Bulletin no. 22. Stellenbosch: Fruit and Food Technology Research Institute. 1971. ^ Desiree Picton-Seymour. Historical buildings in South Africa. Struikhof Publishers. 1989. ISBN 978-0947458010. ^ A. G. Oberholster, Pieter Van Breda. Paarl Valley, 1687–1987. Human Sciences Research Council. 1987. ISBN 0-7969-0539-8. ^ Cecil John Rhodes. sahistory.org.za. [29 October 2011]. ^ Apollo University Lodge no. 357: History: 1870–1914. Apollo357.com. 14 February 1911 [29 October 2011]. ^ Eric Rosenthal. Famous South African surnames. ^ F. Orpen. British Intelligence Records and Maps. ^ Official Intelligence Report. Government of the United Kingdom. 1879. ^ Robert I. Rotberg. The Founder: Cecil Rhodes and the Pursuit of Power. Oxford University Press. 1990 [2012-08-20]. ISBN 9780199879205. ^ History of South Africa Timeline (1485-1975). MyFundi. [2012-08-21]. （原始内容存档于2011-09-13） （英语）. ^ 22.0 22.1 22.2 22.3 Neil Parsons. A New History of Southern Africa. London: Macmillan. 1993. ^ Phelan, T. The Siege of Kimberley. Dublin: M.H. Gill & Son, Ltd. 1913. ^ Thomas Pakenham. The Boer War. Avon Books. ISBN 0-380-72001-9. ^ Roberts, Brian. Kimberley: Turbulent City. Cape Town: D. Philip in association with the Historical Society of Kimberley and the Northern Cape. 1976. ISBN 0-949968-62-5. ^ J. Lee Thompson. Forgotten patriot. Fairleigh Dickinson Univ Press. 2007: 157. ISBN 0-8386-4121-0. ^ Farwell, Byron. The Encyclopedia of Nineteenth-Century Land Warfare: An Illustrated World View. W. W. Norton & Company. 2001: 539. ISBN 0-393-04770-9. ^ "First Records - No. 6 The Name Rhodesia", Northern Rhodesia Journal, Vol. II, No. 4, 1954, pp. 101 - 102. ^ Gray, J.A. "A Country in Search of a Name", Northern Rhodesia Journal, Vol. III, No. 1, 1956, pp. 75 - 76. ^ Domville-Fife, C.W. The encyclopedia of the British Empire the first encyclopedic record of the greatest empire in the history of the world. Bristol: Rankin. 1900: 89. ^ Cecil Rhodes & William Thomas Stead. The last will and testament of Cecil John Rhodes: with elucidatory notes to which are added some chapters describing the political and religious ideas of the testator. "Review of Reviews" Office. 1902. Ziegler, Philip. Legacy: Cecil Rhodes, the Rhodes Trust and Rhodes Scholarships. Yale: Yale University Press. 2008. ISBN 978-0-300-11835-3. Robert I. Rotberg & Miles F. Shore. The founder: Cecil Rhodes and the pursuit of power. Oxford University Press. 1988. ISBN 0-19-504968-3. Vindex (F. Verschoyle). Cecil Rhodes. Chapman and Hall, limited. 1900.